On Friday, August 3rd, the Society for Humanistic Psychology (Division 32) hosted a special President’s Symposium at the American Psychological Association’s Annual Convention in Orlando, Florida. The symposium, titled “The DSM-5 Controversy,” was attended by more than 500 individuals, and was videotaped by the APA for C.E. credit viewing. Brent Dean Robbins was Chair of the Symposium. David Elkins, President of the Society for Humanistic Psychology and Chair of the Open Letter to the DSM-5, introduced the audience to the history behind the recent DSM-5 effort, including the open letter petition, which has gained almost 14,000 signatures and endorsements from more than 50 different organizations, including the American Counseling Association. K. Dayle Jones, who was involved in spearheading the American Counseling Association’s response to the DSM-5, gave a history of the ACA’s criticisms of the DSM-5. Sarah R. Kamens, M.A., who was the primary author of the open letter to the DSM-5, outlined the unique aspects of the DSM-5 controversies, as compared to previous controversies surrounding earlier editions of the DSM. 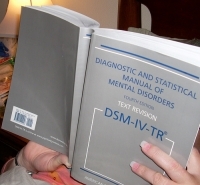 Unique aspects of the DSM-5, according to Kamens, include a stronger leaning toward biological language, and inclusion of disorders with very little empirical support. Lisa Cosgrove’s presentation examined financial conflicts of interest due to associations with industry among DSM-IV and DSM-5 panel members. J. Douglas Bremner, a psychiatrist at Emery University, highlighted problems with the trauma spectrum psychiatric disorders as defined by the DSM-5. Finally, Brent Robbins examined how the new pediatric diagnoses, such as Dysphoric Mood Disregulation Disorder, lack empirical evidence and promise to make normal children more vulnerable to over-medication with antipsychiatric drugs. The symposium was very well received by the audience. A question and answer session revealed primarily supportive comments from the large crowd in attendance. A follow up question and answer session, scheduled the following day, included comments from APA President Melba Vasquez, former APA President Frank Farley, Jonathan Raskin, Peter Kinderman, and others. It was announced at the symposium that the coalition for DSM-5 is now planning a summit which will include international leaders of mental health organizations, in order to explore potential alternatives to the DSM-5.